We all have them, but can always use more - - Quilty Friends for Life! Plus, see two new quilts sure to become classics! As much as I love the artistic side of quilt-making, the process of creating something visual and tactile, something full of color, texture and purpose - - I love the relationships that are built through quilt-making even more. Quilt-making is as social as it is artful. It's a dream to work in a shop filled with fabric. Seeing all of you walk through the door, catching up on what's new, laughing, crying and, yes, shopping for fabric together is what truly makes each day meaningful. Think about how many friends you have because you connect through sewing! Whether it's spending time with relatives around the quilting frames, going for a girl's sewing-night-out, joining a class, meeting with an official quilt guild, teaming up for charity quilt-making, going on a retreat, pulling together an "Epic Sew Day" (shout-out to the Nebo Modern Quilt Guild!) or simply taking some stitches on the couch next to a good friend - - we build some of our most cherished friendships through quilting. Shannon White (you've seen her adorable, dimpled smile behind our cutting table) has more quilty friends than anyone I know! One friend in particular has become dear even though they live more than an ocean apart! Shannon first met Yvonne Van Rijn on social media through a compliment left on her blog. Shannon lives here in Utah; Yvonne, in the Netherlands. Both talented quilters, they connected easily but the friendship that developed goes beyond. Nine years later they make regular quilting travel plans. They are often mistaken for sisters (the resemblance really is uncanny)! We feel they were always meant to be friends but it was quilting that brought them together. We are honored to have Yvonne Van Rijn as a special guest teacher this week at our Handwork Club! She recently arrived from the Netherlands for a quilting visit with Shannon. 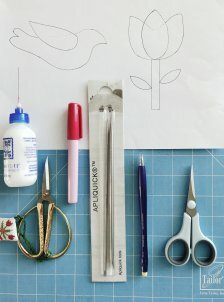 We invite you to join in as she shares her favorite applique technique with us. Believe me when I say Yvonne has a gift for handwork! Simply bring the few items on the supply list below and gather with our Handwork Club to learn something new during some valuable stitching time. No registration necessary. By the time you leave you will have added a few new quilt-making friends to your list. Fabric - Background fabric in neutral color. Bird - 2 bird colors (one for wing). Tulip - 2 tulip colors plus green for leaves & brown for stem. be sure to visit our calendar and class list via our website! Speaking of applique... Marianne Michaels recently finished this 65" x 74" applique beauty! She chose both wool and cotton fabrics for the polka dot flower vines and hand-appliqued them on a cotton background. 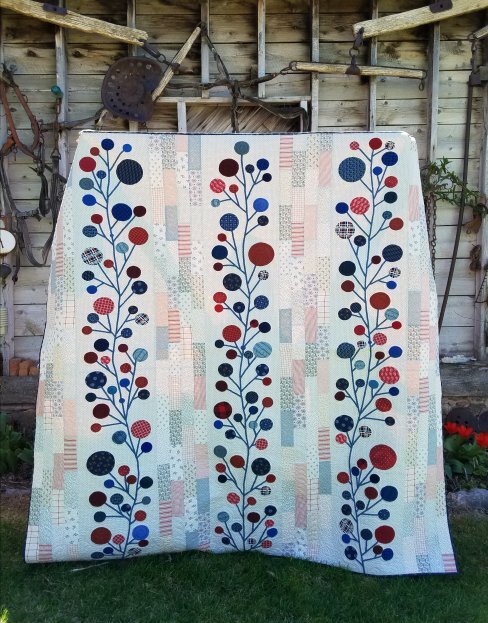 How is it that this quilt has a modern feel with decidedly vintage, folk-style roots! LOVE! Polka Dot Garden is a pattern by Minick & Simpson currently available at the shop along with kits! 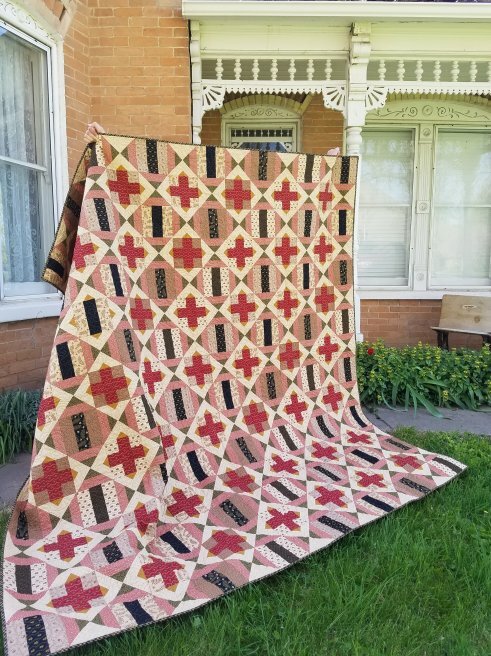 Doesn't this classic quilt look like it could have been pulled from a trunk in grandma's attic? Pieced by Suzanne Adams & machine quilted by Ramona Sorensen, Walnut Creek, designed by Nova Birchfield using fabrics by Jo Morton, is sure to become an heirloom! Jo Morton's most recent collection is on our shelf now & kits will be ready very soon! April 30th - 25% off all regular price MODA PRECUTS! Thursday, May 3rd, 5:00 - 8:00 p.m.
Zip-up Tray Pouch – Opens out into a flat tray then zips closed into a rectangular pouch. So cool! $20 class fee. Supplies not included. Stop in to pick up a copy of our new class schedule featuring events running May - August. See new shop samples and enjoy discounts on select classes and supplies! The UFO number for April is 7.